Rugby players from Avoca Beach Rugby, Kiama Rugby and Bowral Rugby form a guard of honour at the Waratahs-Brumbies game. (Image: Murray Richards). 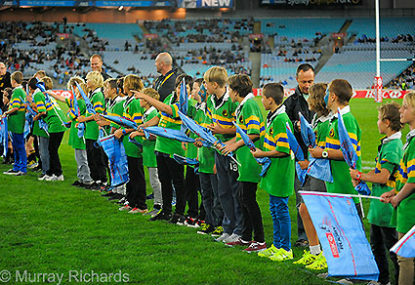 The commitment to junior rugby from the Waratahs and ARU in NSW has turned a full circle. In the past this often strident critic bemoaned that the Tahs lived in a self-created eastern Sydney cocoon and junior rugby (especially in regional NSW) was virtually being ignored – and there was a level of truth in this. Certainly it characterised the years prior to Michael Cheika when the Tahs and ARU Junior Development Team were not exactly embracing a joint junior rugby engagement strategy. Roll forward to late 2012/2013, the Tahs – ably assisted by a small but professional and passionate team of ARU development officers – have engaged the NSW community on an unprecedented level. This year, thus far, the Tahs have visited kids for clinics and meet-the-players sessions at Sylvania, Chatswood, Penrith, Parramatta, Manly, Armidale, Hunter, Ryde, Newport, Coogee, Merrylands, Byron Bay amongst others. Indeed Michael Cheika, Dave Dennis and Wycliff Palu joined the often overlooked Penrith Rugby Club for their 2013 season opening night! “The boys were provided with Waratah flags to wave announcing the arrival of the Tah’s. Although the boys were clearly supporting the Tahs, the arrival of the Brumbies really excited them as a number of the players high fived the boys as they ran through the guard of honour. “Next the Tahs ran through the guard, with the boys waving their flags like crazy, it was a great sight. “Just the look on the boys faces leaving the field after being so close to the players highlighted the importance of the night for me in cementing rugby at its ground roots. The Waratahs are conducting an open training session on June 12 at Allianz Stadium between 3.00-5.00pm. Three days later, two qualifying primary schools will play off for the State Primary Schools Championship, which will precede the Waratahs vs British and Irish Lions game on June 15 at Allianz Stadium. 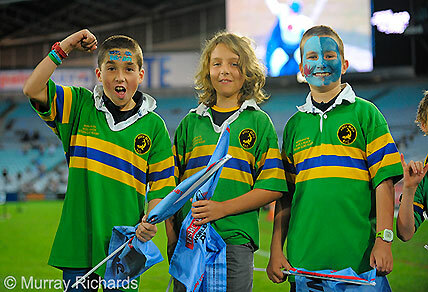 Young Waratahs fans at the Waratahs-Brumbies game. (Image: Murray Richards). 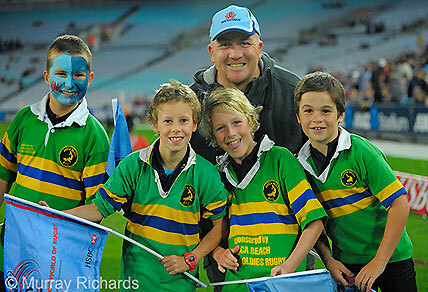 Young rugby players at the Waratahs-Brumbies game. (Image: Murray Richards).